Hello friends, It has been a while since my last post. I really sorry for disappearing for that long and I know that some of you are a bit disappointed at me. I also want to say thanks to those of you who e-mailed me to check whether everything is okay with me. Yes, I am okay and I am back here again with so many new ideas and interesting materials. I just want to have more time to share all I want you to know. Today I am going to share something very interesting with you. Have you ever heard about Rejuvelac? This is homemade internal flora that is a cultured probiotic-rich drink made by fermenting grains in water. I am sure most of you know that bowel flora helps our body to assimilate and digest foods we eat. Rejuvelac is rich in Vitamin B complex (especially b12, critical for vegans), Vitamin K and E, water-soluble minerals and lactic acid (very good for the skin). It is also known as a natural laxative that helps in relieving constipation and breaking down undigested waste material in our bowels. Internal flora inhibits the growth of pathogenic organisms and covers over all the intestinal inner linings that keep our cells active and able to reproduce. You have to know that rejuvelac is a bit different from kombucha, miso or kefir because here we don’t use any specific culture starter. I personally consider this more as a wild fermentation because all of the microorganisms are present naturally on the grains themselves. Rejuvelac has a lemony and sour taste. 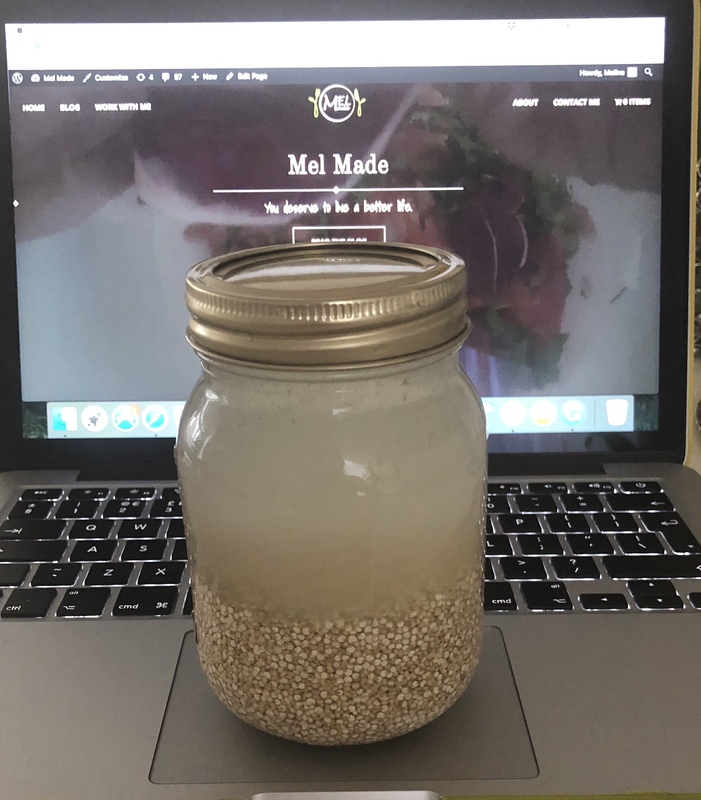 It is very easy to make, all you need is 1 cup of grain (rye, oats, brown rice, barley, quinoa or barley) to 2 cups of water. I prefer to use organic quinoa simply because it is gluten free and I like the taste of it. First, rise the seeds well and put them in a glass jar with 2 cups of water. Soak the seeds for 24 hours in a warm place (15 C to 26 C). Strain out the seeds and the water that left after this process is rejuvenac. What I do is to put the seeds in the morning and leave it until next morning. I drain the water and add some lemon for more flavor and I drink it first thing in the morning. I add 2 cups of water to the same jar and seeds for the next morning. You can reuse the same seeds about 5 times. I have to say that since I started drinking rejuvelac my digestion got much better. As I don’t feel good when I eat yogurt, it makes my stomach bloated and having spasms. I think it is very good for people who have a dairy intolerance or for vegans. Try it, you won’t regret after that 🙂 and I am sure it will become part of your daily routine.